Maxi Jawlock is a strong, pull tight, plastic security seal with a smooth, 4mm diameter strap and integral metal locking mechanism. Available here in packs of ten, 300mm tail length, pre printed with sequential numbers and normally available for dispatch within 2-3 days. Please note* these seals do not have the side tear off option pictured above. Easy to use, pull tight, plastic security seals. Pre printed with sequential numbers. In Green only. Packs of ten seals. 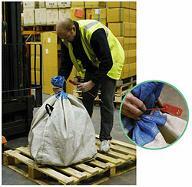 300mm length (no tear off) @ £4.95 per pack excl VAT.